Welcome to the Ultimate Infant Prize Bundle Giveaway! This is an amazing prize pack from Tiny Love (we are big fans of this brand here at Nanny to Mommy) and I am excited to offer the opportunity to share this amazing giveaway with my readers! 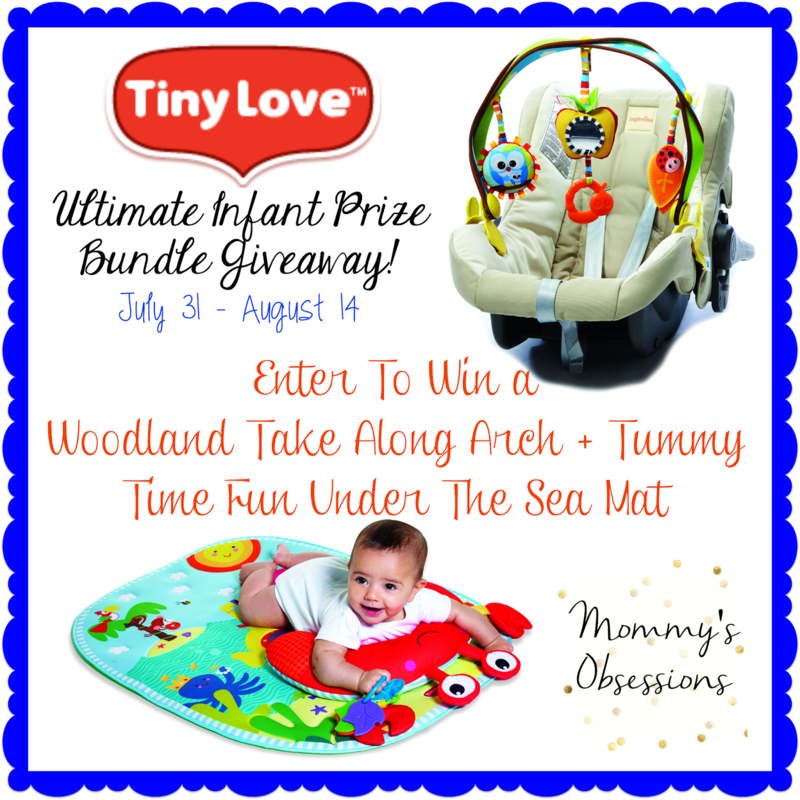 Mommy's Obsessions has teamed up with Tiny Love to bring you the Ultimate Infant Prize Bundle; the Tummy Time Fun Under The Sea Mat and Woodland Take Along Arch! When your little one starts to grow and develop basic skills and muscle control, it's important to give them the appropriate amount of daily developmental stimulation that they need to flourish and grow! Tummy time is a huge part of development and although some babies aren't a fan (my first son sure wasn't! ), it sure helps them build those neck muscles! As your child grows you will also notice them reaching for toys and developing their grasping reflex, so I always loved having a car seat toy arch for Little Mister when he was a baby. Not only did it provide entertainment for him, but it also gave him visual stimulation and helped him build the skill of reaching and grasping! One of our favorite baby brands, Tiny Love, has recently introduced two new products that we are very excited to share with you; the Tummy Time Fun Under The Sea Matt and Woodland Take Along Arch! To see the full review of the Tummy Time Fun Under The Sea Mat and Woodland Take Along Arch, use this link! We love Tiny Love for our babies and we know you will too! To Purchase: Visit Tiny Love and grab your Tummy Time Fun Under The Sea Mat for $29.99 and Woodland Take Along Arch for $24.99! To Win: Mommy's Obsessions & Tiny Love want to give one lucky reader a their own Ultimate Infant Prize Bundle (includes Tummy Time Fun Under The Sea Mat and Woodland Take Along Arch). The Giveaway will close late on the evening of August 14th. The winner will be chosen at random through Giveaway Tools. The winner will be announced both on Giveaway Tools form as well as notified by email and announced on Mommy’s Obsessions Facebook. The winner will then have 48 hours to claim their prize otherwise they will forfeit said prize and a new winner will be chosen. The winner will have their prize sent to them by Tiny Love, Mommy's Obsessions and other participating bloggers are not responsible for prize shipment. Must be 18 years and older. Facebook, Twitter, Pinterest, and Google are in no way affiliated with this giveaway. No Purchase Necessary. Void where prohibited by law. US Only. Please direct questions, comments, and concerns to Mommy's Obsessions. Mommy's Obsessions has been provided with product to review by Petite Trinklets but has not been monetarily compensated for this giveaway. This disclosure is done in accordance with the Federal Trade Commission 10 CFR, Part 255 Guides Concerning the use of Endorsements and Testimonials in Advertising.